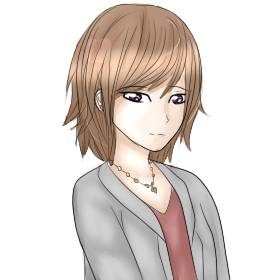 Suzie is the ultra sweet and kind teacher from Arasysia who appears in chapter one as the school teacher for the kids, and in chapter 2 onwards as Aris's guardian. Suzie was a college friend of Kory, as she skipped several grades due to her intelligence. She is close with some of the adults of the town, including Julie and Celeste. She loves Aris unconditionally and absolutely adores him, and is one of the few people to see his sweet side all the time (Sort of). She's very nurturing and loves to bake and cook. She loves mathematics and science. - Originally, Suzie's face sprites (From the generated pack) Only had two variations. - Suzie was meant to play a smaller role and disappear after the first chapter, but later on became plot important. - She's inspired by my grade 4 history/ grade 5 home room teacher- Mrs. Carmicheal, mixed with my third grade and first grade teachers: Mrs. Shaddinger and Mrs. Norton. - Suzie creates and runs peaceful protests to protect people and animals alike to defend the rights of humans.